The Nick: Open Mic. 9 p.m. Oasis: Tommy Trumpet. 8 p.m.
Bar 31: Singer/Songwriter Night. 8 p.m.
Ghost Train Brewing: Voodoo Visionary. 11 p.m.
Iron City: Trey Anastasio Trio. 7:30 p.m. The Nick: Ham Bagby & The Seige, Sound & Shape, The Collection. 9 p.m. Oasis: AJ Beavers. 8 p.m.
Tin Roof: Eric Paslay. 7:30 p.m.
Tin Roof: Jam. 9 p.m. The Firehouse: Zeta, Wastelands, Black Hole Kids, JoyBoy. 8 p.m.
Iron City: The Breeders, Flasher. 8 p.m.
Little Italy’s: Open Mic. 8 p.m. The Nick: Stoni Taylor & Miles Of Stones, Chris Simmons Band, The Dozens, Matt Witte. 10 p.m.
Oak Hill Bar & Grill: Open Mic. 8 p.m. Oasis: Frank Jordan. 8 p.m.
Saturn: Caitlyn Smith, Andrea Davidson. 8 p.m.
Zydeco: Tauk, Dynamo. 9 p.m.
Iron City Grill: Brian Dunagan. 6 p.m. The Lyric: Tommy Emmanuel, Amanda Shires. 8 p.m. The Nick: Amplified Heat, Zach Longoria Project. 10 p.m. Oasis: Leif and Gary. 8 p.m.
Saturn: Pigeons Playing Ping Pong, Funk You. 9 p.m.
Zydeco: The Sword. 9 p.m.
Avondale Brewing Company: Railroad Earth, Shannon McNally. 6 p.m.
Black Market: Kristen Ford, Tiger Loaf. 10 p.m.
Linn Park: Pink Pyramids, Little Girl. 11:30 a.m.
Moonlight on the Mountains: Mutlu. 7:30 p.m. The Nick: The Southern Belles, The Dirty Lungs, Step Sisters. 10 p.m. Oasis: New Merkle Revue. 8 p.m.
Saturn: Houndmouth, Frederick The Younger. 9 p.m.
Tin Roof: Trey Lewis. 10 p.m.
WorkPlay: The Maine. 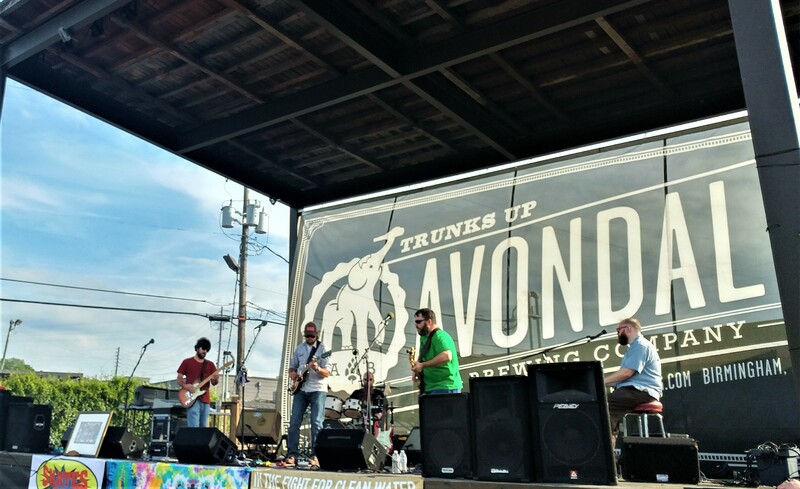 7:30 p.m.
Zydeco: Wick-It The Instigator, DJ Jeff C. 10 p.m.
Linn Park: JQ’s One Man Big Band, Amen Corner, Startle the Heavens, Muad, The High Fidelics, The Dizzy, Ritual Eyes. 11 a.m. The Nick: Chelsey Whild, Catalina, MRYGLD. 10 p.m. Oasis: The Murder of Jane Crow. 8 p.m.
Saturn: The Main Squeeze, Joe Hertler and The Rainbow Seekers. 9 p.m.
Tin Roof: Andrew Velez. 10 p.m.
Zydeco: The California Honeydrops. 9 p.m.
Daniel Day Gallery: The Lucky Losers. 2 p.m.
Iron City: Black Veil Brides, Asking Alexandria, Blessthefall. 6:30 p.m.
Linn Park: The Matchcoats, The Bouquets, Future Primitives, Satin Dogs Duo, Opov. 11 a.m. The Nick: Blue Yonder, Towne, G.W. Henderson. 10 p.m. Oasis: Daniel McNabe. 8 p.m.
Rails and Ales: Jackson Walls. 1 p.m.
Rojo: String Theory. 5 p.m.
Saturn: Touché Amoré, Culture Abuse, Razorbumps. 8 p.m.
Know a Birmingham show that we should add to the calendar this week? Send the details to tom@magiccitybands.com. Be sure to include the day, time, venue, and the names of all the bands playing. 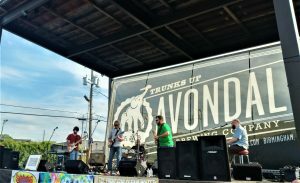 Pictured: Earthbound perform at Avondale Brewing for Earth Day.